Online travel booking in India is no longer a nightmare. It is quite safe to book tickets and hotels and package tours online. Firstly I don’t think many of the ‘travel’ portals that mainly sell tickets can be considered as ‘travel’ portals. They are ticketing portals. The real ‘traveling’ starts only when you reach your destination. Some of them are relatively dynamic portals but options in a one stop shop catering to all travel needs remains few. The online space is mainly driven by domestic air ticketing but the railways need to play a more crucial role to make them successful. Studies suggest that more than 2,000 towns and cities are accessing the Net for booking travel. Secondary cities account for 74 per cent of business and rising. In 2009-10 more than 25 per cent of all airline tickets are booked online. Despite myths India’s online market Tourist bookings in most sectors (accommodation, airlines, car rental etc.) are still made over the phone, email or in the provider’s office, rather than on-line. So the share of internet bookings remained small but growing. I think consumers in India are still not comfortable booking on-line due to concerns over payment security. But these concerns of the traveler are being addressed and many government and non government travel sites are today considered ‘safe’ bets. Many service providers and intermediaries are still not offering the full range of travel products (accommodation, flight tickets, car rentals etc.) on their portals and it is sometimes cheaper not to book on-line. However with advancement in on-line payment security, the presence of more developed portals of direct providers as well as intermediary travel portals, and with greater internet penetration, internet booking is expected to gain significance during coming days. A recent report in Economic Times said the slowdown has been good for the online travel industry. It has actually seen a lot of people moving from offline to online booking. A survey found that traffic to these sites grew to more than 14 million visitors in April 2010, an increase of 50% over April 2009 as a growing number of Indians turned to the web in search of travel deals and accommodation. This is one opportunity online travel industry should really grasp. This could be the beginning of a new phase in the industry. Today there are more payment options available online. Last August (2009), the RBI issued guidelines making it mandatory for all online transactions to have an extra level of authentication. People feel more secure transacting online. Travel sites now attract more than one-third of India’s total Internet population. Today’s smart consumers are being cost-conscious while making travel arrangements. They are diligently comparing prices before choosing. Actually the recession was good for the travel industry as it forced them to think out of the box – increase efficiency, innovate and design customized packages to retain clients. So we are looking forward to a market that is mature, growing and more users oriented. All invited to contribute by sharing your thoughts, views on this blog post, through the comments / blog. Hereby, looking forward to conversing with you! 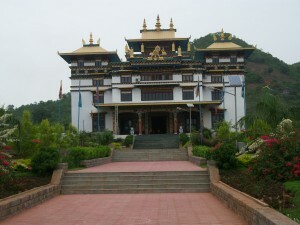 Chandragiri – The Little Tibet: An offbeat destination..
Phuntsokling or the ‘land of happiness and plenty’ is just 80 kms from Brahmapur, in the Gajapati district, little Tibet in the Western Orissa, now called Odisha. This was one of the earliest resettlement villages. The Tibetan guests arrived on May 1, 1963 and gave their own name to a remote corner of a land that welcomes all. Besides, Chandragiri Tankilipadar, Lobarsingi, Jiranga, and Mahendragada were the other resettlement villages. With temperatures between 40-80 degree Farenheit, this is hardly Tibet but sheer zeal and hard work has transformed this jungle into fertile fields and orchards. After a project to increase agricultural yield this is now the official “Maize bowl of Orissa”. Colorful prayer flags – carrying the message of peace and tranquility will welcome you. The Tibetan cooperative society of Chandragiri now runs a handicraft centre, dairy centre, poultry centre, horticulture centre, health centre, mechanical workshop, an elderly person’s home, crèche, schools and Buddhist monastery. The bus journey is uniquely Indian – people, chickens and the occasional goat share space. An hired vehicle is much more comfortable and convenient. At Lobersing, another resettlement village and bus stop you’ll find exquisite Tibetan wall mats, carpets, handicrafts and leather goods in the co-operative society factory. The superior will show you around. Just across the road is the village monastery. Young lamas jostle around – like everywhere in India cricket is popular while the elders rotate the “chakra” humming prayers, like gentle apostles of non-violence. You can stay at the Society’s Guest House. Just two words of caution – protect yourself against mosquitoes and order your lunch or dinner early. His holiness the 14th Dalai Lama inaugurated South Asia’s biggest monastery – the Rigon Thupten Mindoling monastery called the Padmasambhava Maha Vihara at Jiranga. Chandragiri on January 2010. 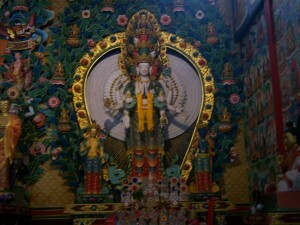 A huge 21 feet high golden statue of the Buddha presides with statues of Lord Padmasambhaba and Lord Avalokiteswara on either side. 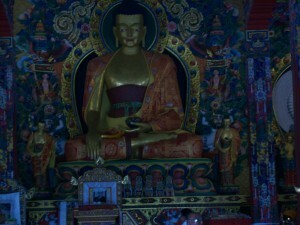 Incidentally Acharya Padmasambhava was the founder of the Vajrayana sect of the Mahayana path of Buddhism who lived during the seventh century in Orissa (place of birth was Oddiyana – some say its in the Swat Valley of Pakistan, some believe it to be Orissa) who is said to have transmitted Tantric Buddhism to Bhutan and Tibet. In charge of the monastery Khenpo Pema expects an influx of foreign tourist and there is already a spanking new 10 suite guest house to welcome them all. Jaampa the chief architect ensured that the monastery has all the flavours of Tibetan architecture. Nearby the perennial hot spring of Medicinal Sulfuric Waters of “Taptapani” is nestled at about 1800 feet above Sea Level. The guest house overlook a pristine valley. The Dining Hall is between two crests of mountain fold. You get an eerie feeling amid buzzing crickets in the evening. In the nearby Kandimata Mandir locals take a bath in the spring before offering prayers. There is also a deer park nearby maintained by Orissa wildlife conservationist. Eco-tourism means making as little environmental impact as possible and helping to sustain the indigenous populace, thereby encouraging the preservation of wildlife and habitats when visiting a place. This is a responsible form of tourism and tourism development. It is also the key to sustainable ecological development. The International Eco-tourism Society defines eco-tourism as “responsible travel to natural areas that conserves the environment and improves the well-being of local people.” You must – Minimize impact, Build environmental and cultural awareness, Provide positive experiences for both visitors and hosts, financial benefits for conservation and local people. Today the “Green Laws” of conservation are making people aware of how man and the environment can live symbiotically it is the only way to maximize the economic, environmental and social benefits of tourism. In India too the movement is gathering momentum. Eco-Tourism in India is still at a very nascent stage, but there are for sure conscious efforts to save the fragile Himalayan Eco System and culture and heritage of the indigenous people. Holiday Camping vis a vis Hotel accommodation are gathering momentum in the Himalayan belt. Resorts tucked deep inside jungles of Karnataka, House-boats of Kerala, Tree Houses at Vythiri combine to make India one of the most diverse eco-tourism destinations on the planet. Education -Three levels of education; how well the staff is educated, level of education the organization provides to local communities, and how well it informs guests about sustainable tourism practices and how to successfully practice themselves. Conservation and Preservation – This pertains to the level of conservation/ preservation activity in the environmental and cultural sectors. This category will determine the flow of visitors – ultimately.. Sustainable Use of Resources – This category involves how well the resort utilizes, preserves and recycles resources, and the effective techniques they practice. This category will focus on water, waste and energy resources. Innovative/Creative Practices – Many are developing new approaches to conservation, education, marketing, and creative ways to sustainably use resources. This category focuses on these new approaches because they are direct factors contributing to successful ecotourism. Influence on Local Communities Economies – This category determines if the involvement of the organization with the surrounding communities brings new economic growth to the local community. Involving local human resources in the projects – This would ensure local support for the organisation and the activity both. Local and Global Recognition – This category determines to what extent the local and global familiarity the ecotourism organization. Marketing Practices – The way an organization market’s itself, will ultimately determine its survival/sustainability. Involvement of Local People – This is about community participation. Say a stay in a village to experience ethnic life and functions first hand – lets say a stay at the lantern lit hut of a former Naga headhunter or a trip to Jatinga bird sanctuary to witness the eerie phenomenon of hundreds of birds flying to their death on foggy, windy, moonless nights during August to October. For there cord the only similar phenomena exists in the Phillipines. Product launches and dealer meets are basically working vacations. The ambience needs to be sufficiently relaxing but boardroom facilities are a must as launches and meets entails some serious business work. A relaxing ambience of the seaside resort is an added advantage. It houses one of the largest conference centres in the state. Without going into the mundane details let us say that technical and secretarial services available here are efficient and competent – without the seven star price tag. There is something for every budget and a smaller budget does not mean ‘diminished’ returns. Even menus are customised to suit the corporate need and individual tastes. But why Puri – let us say that the resort is trying to mould itself to modern needs. Nature trails, sustainable eco tourism, continuing campaign to keep the beach clean – all these have added another dimension to a timeless destination – the seat of the Lord of the universe. Organizers and trainers know the potential of time outside the seminar room. Toshali sands will assign you a dedicated conference coordinator to make all the arrangements. Toshali Sands provides a conducive environment for product launch, seminars & conferences, dealer meets etc. The conference halls are – Indraprastha with a capacity of 350 (theatre style seating) offers double option with a collapsible partition for small meetings (over 200 people) and Boardroom parleys. Panchayat Conference hall can accommodate 200 in theater style and Mantrana Conference hall is relatively smaller but equally well appointed. Different from the more conventional type but you have an usually high level of service right from organizational to technical facilities, secretarial services etc. All corporates try to host Conference programmes for their executives in a relaxed and stress-less environment, where there will be better clarity of thought and vision. The concept of ‘business with leisure’ is here to stay and the key word in today’s corporate world where resorts pronounce themselves as superior to commercial hotels. Toshali Sands is not exactly competing with 5 star luxury hotels but as far as the settings and ambience goes. This is one of the best Eastern India has to offer, a four star classified resort. The Puri Kshetra is considered a holy place since millenniums. Toshali sands is aware that most people do pay a visit to the temple of Lord Jagannath – a guide, priest and transport is all for yours to ask. It is still early days for Toshali sands to start off as an attractive destination for national product launches but it is a fantastic destination for regional and zonal launches. We will be working our way up to making this a national destination. Recently, “The Blue Eyed Boy”- the new Maruti Suzuki Wagon R was launch at Toshali Sands by Maruti Udyog Limited in the holy “Sankha khyetra” of Shree Lord Jagannath, it was a huge success among Maruti dealers and distributors. the event drew wide corporate participation and national press coverage. I would love to hear, your product launch at Toshali Resorts, we would be glad to have you as our guest. If you enjoyed this post, I would appreciate, if you share it on Twitter, Facebook, Orkut and other social networking sites. The geographical size of Puri resembles a right oriented conch shell, the ‘Dakshinavarta Shankha’, which is why the name. The sacred section of puri looks like a conch shell and it is in this section that all the sacred centres like temples, mathas (English word for this), sacred tanks, trees and various other sacred sites are located. The Shankha Kshetra covers an area of roughly 10 square miles, out of which nearly 40% is submerged under the sea. Shankha Kshetra of Puri includes the Temple of Lord Jagannath and its huge compound circumscribed by a wall called Meghanada Pacheri. The temple complex is surrounded by streets or sahi, running in all directions from the temple. The sebakas (English word) live in the streets, which are close to the temple and monasteries, temples of several gods and goddesses, sacred tanks and trees, recreational and gymnastic centres (Jegaghar and Akhada (english word)) are located in different places scattered throughout the town. The shape of the sacred section of Puri resembles a conch shell (Shankha) and, therefore, it is also known as the Shankha Kshetra. Like the other names, that is, Shri Khetra and Purusottam Khetra, which have bearing on the Lord Jagannath, the paramount deity of Puri, Shankha Kshetra has equal ritual and symbolic significance. The name Shankha Kshetra is the most significant because Shankha is one of the Aiyudhas or weapons of Lord Vishnu who resides in the navel or the central part of the shell in the form of Lord Jagannath. 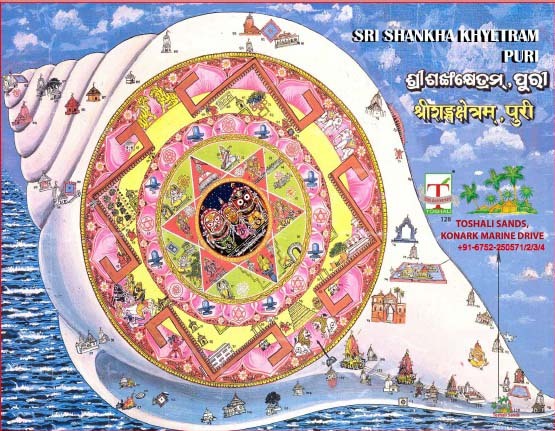 Shankha Kshetra is about 10 miles in extent, of which nearly two koshas are submerged in the sea and the remaining three koshas are above water. In the centre of the Kshetra lies the hillock called Nilagiri where the famous temple of the Lord Jagannath stands. The broad end of the Shankha Kshetra lies to the west where the temple of Lokanath, one of the eight noted Shiva Temples of Puri is located and on the apical end or the cone in the east, is located another Shiva Temple called the Nilakantha. The area between the two temples is two miles and is the most sacred. According to the Tantric philosophy, the Shankha Kshetra is made up of seven concentric folds. The innermost or first fold, which forms the navel, or the Kshetra, is the seat of the divine platform on which the Lord Jagannath with his elder brother Balabhadra and their sister Subhadra are presiding. The second fold, which is the outer layer of the first or the innermost fold, is hexagonal in shape and in this are located four goddesses of power, two tirthas, two sacred trees, Garuda (vehicle of Lord Vishnu) and the top of the Nilgiri hill which is convex like the back of a tortoise. The goddesses are Bimala, Kamala, Sarbamangala and Uttaral. 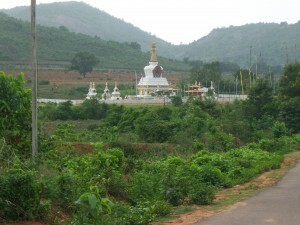 The sacred trees are Kalpapadapa and Salmalitaru. The tirthas are Rohinikunda and Pranitodakakunda. The third fold, is the central part of the lotus-like structure having eight petals, each inlaid with an idol of Lord Shiva and a goddess. The eight Shivas are Agneswar, Bateswar, Khetrapaleswar, Chakreswar, Baikuntheswar, Pataleswar, Isaneswar, and Lokeswar. The eight goddesses are Dwarabasini, Mahabajreswari, Swanabhairabi, Bhadrakali, Bhubaneswari, Mahakaliaghorea, Sitala, and Jagnyeswari. These deities are responsible for watching and guarding the firstfold having the Supreme Lord at the centre of the sacred complex. The fourth fold, forms the convex surface of the temple precinct (Mahakurma) and the inner compound wall. The fifth fold, which is the outer layer of the fourth fold, is again the seat of another eight Shivas and eight goddesses. The Shivas are Bisweswar, Markandeswar, Mahakaleswar, Karnameswar, Mukteswar, Ugreswar, Kapilalochana and Agreswer. The goddesses are Bisweswari, Saptamatrika, Dakshinkali, Charchika, Alameswari, Barahi, Banadurgeswari and Basulikeswari. 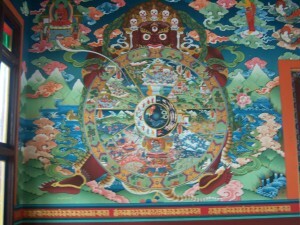 These deities are also in charge of watch and ward functions of the sacred complex. In the sixth fold of the sacred space there are four ashrams. They are Angirs in the east, Pandu in the west, Markandeya in the north, and Bhrigu in the south. The seventh fold which is the outermost zone consists of the sentries of the Shankha Kshetra and two pilgrim centres. That’s all or is it? Theres another legend. This place is named after demon Shankhasura who was killed by Lord Vishnu. Shankhasura was born from the sweat of demon Madhu. Vishnu killed Madhu when he was on the verge of killing Brahma. Shankhasura wanted to avenge Madhu’s death. He pleased Shiva by his penance and learned Tantra from him. While he was learning Tantra he could hear the recitation of veda. Rishi Yagnavalkya was learning Yajur veda from Brahma at the moment. Shankhasura wanted to learn the recitation and he asked Shiva for the source. Shiva instructed him to go to Brahma to learn the Vedamantra. But Brahma had already distributed the four Vedas among his disciples, so Brahma refused to teach him Vedamantra. Shankhasura was enraged and he took away the four Vedas from the disciples forcibly and hid them in the sea. Lord Vishnu took on the incarnation of “Meen” to search for the demon. The demon hid in the Kalpa Vriksha inside the present temple. Lord Vishnu tried to kill the demon. The demon hid in a conch. Vishnu used teh Sudarshan chakra but the hard conch diverted the chakra. Finally Vishnu killed the demon with his Brahmastra. Shiva was furious at the death of his disciple. The assembled gods pleased Shiva by singing “Vedasara Staba” (glories of Shiva). He requested Vishnu to name the place as Shankha kshetra after the name of Shankhasura. The proposal was accepted and the place was named as “Shankha kshetra”. Toshali Sands has exclusive arrangement to take you to places of your interest in the “SHANKHA KHYETRAM” and “RATH YATRA” – THE CAR FESTIVAL. To Know more, contact Toshali Sands, Puri travel desk or leave your comment, we wil get back to you. I would be glad to hear more about Shankha Khetram, please post if you feel any informations in the blog is missing. And would be gald to have you as their guest at Toshali Sands. If you enjoyed this post, I would appreciate, if you share it on Twitter, Facebook, Orkut and other Social Networking sites. “Save Earth”. We have nowhere else to go. Its not my slogan and I dont know whose it is. The stark word of Carl Sagan – an astronomer drills in the need for a clean environment – a clean earth. One excerpt from his – “Pale Blue Dot”. Dont read it, just feel it. Frightening? Perhaps. Truth? Absolutely. In Toshali Resorts, long before eco tourism became fashionable and government started to support initiatives we have been travelling the green path. The idea was to be in harmony with the surroundings. Toshali Sands had a great advantage. It was next door to a pristine beach, with 30 acres to spare. The area has been forested since 1989. Some 40 thousand trees and shrubs have been planted. Coconut, betel nut, bottle palm, ashoka, mango, casurina- mostly local fauna. They survive better and gel seamlessly. The idea was to compliment the Balukhanda reserve. The ‘view’ is definitely greener now. Solar energy use is in. It will continue to be a priority and the windy beaches may see a few windmills too- nothing definitive yet, just a thought. From the sea to the hills – Toshali Royal View Resort in Shilon Bagh, Shimla, is nestled on the pine slopes of the Kinnor Hills overlooking the snow clad peaks of the Himalayas. It is just half an hour from Shimla down the Kufri-Chail road. The building has a quaint old world feel. Frankly a gaudy building block on a dense pine slope would be an eye sore so the architects got us a design that blends with the surroundings. Planting trees is a not a special ‘drive’ here it is part of the ‘job’ – the overall attempt to blend in – environmentally, culturally and visually. Deodar, Himalayan fir and spruce are some of the species we have planted. Toshali Jungle Lodge, Simlipal, is a unique resort. It is situated in one of the original 14 biosphere reserves of India and near a tiger reserve. It offers the visitors a unique ‘wild’ environment. A resort in a biosphere has to adhere to the strict guidelines – no littering, no trash, no activity disturbing the wildlife – just blending in – unobtrusively. We are bystanders watching life in the forest go by. We are lucky to have the privilege of watching ‘nature at work’. Without trying to sound too pompous Toshali is the only quality accomodation in the ‘neighbourhood’. And the quality does not come at the cost to the nature. The idea is – to leave things as you found them when you came. If you like the Blog and want to save the environment, do email and share with your friends at Facebook, Twitter, Orkut and other Social Networking Site. We will be glad to recieve your comments and conversations.